There's a thin line between success and failure in movies. Take, for example, Kevin Costner's "epic" Waterworld, which I've somehow managed to miss until now. In fact, people have always told me I'm right to have missed it. But really, there's very little difference between Waterworld and other classic action adventures like Raiders of the Lost Ark. Costner is almost as cool as Harrison Ford, with the gills behind his ears, his webbed feet, and his ability to swim all the way to the bottom of the ocean to see lost cities, kind of like the Statue of Liberty's famous appearance in the original Planet of the Apes. Where things get dicey is the moment his co-star, Jeanne Tripplehorn, says, "We're going to die here, aren't we?" after Dennis Hopper's gang of Smokers leaves them for dead on Costner's beloved burnt-to-a-crisp ship. Of course they're not going to die there. Just moments before, Costner had shown Tripplehorn how he can breathe under water for inordinate amounts of time. And still before that he had shown her how he could take her all the way to the bottom of the deep sea with absolutely no problem at all. Writing and plot-point slips like that keep Waterworld from becoming a classic. Or at the very least a cult classic. It's a damn compelling movie otherwise. The premise is hard to beat when it comes to sci fi: the Earth has been swallowed by the sea and this is what happens many years later for the surviving barbarians. Even the second-to-last scene, when Costner hilariously (I literally burst out laughing) jumps out of a balloon to pluck the little girl out of the water before she is potentially killed by a bunch of evil knuckleheads on ATVs, couldn't have kept the wack-job film from becoming a classic. 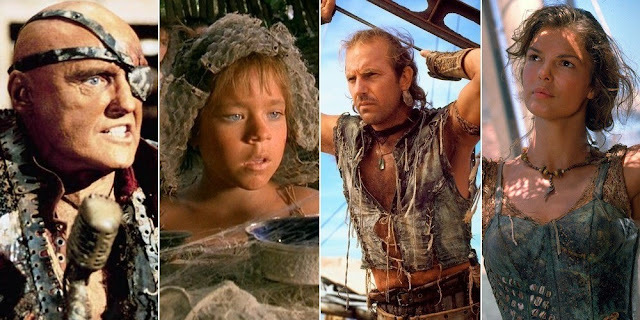 It's no surprise that the two female leads, who suffer from the hands of an earlier time when it was normal for the likes of Costner and Hopper to bat them around like rag dolls again and again, never saw their careers take off like rockets after Waterworld. Tripplehorn somehow managed to salvage a bit of a career with roles in TV's Big Love and as Jackie Kennedy in Grey Gardens (she does look like Jacqueline O). Tina Majorino as the little girl could have perhaps become a massive star if not for her involvement in Waterworld, with great dabbles of success in Napoleon Dynamite and also a bunch of TV shows, also including Big Love. I frankly couldn't take my eyes off Waterworld. Like a ship going down. But it did take me three installments of watching over three consecutive nights. I would have hated to be in the movie theater watching it all in one stretch. This is one of my favorite good bad movies. In terms of aquatic themed movies it's so much better than Captain Ron. Great review!